I thought I’d jump in with the 5 on Friday link up crew to download a few random thoughts and get caught up to speed around here! Our little Wild Man is turning 1 in less than 3 weeks, which is just totally blowing my MIND. This entire year has seemed like a giant fuzz of moving and travel and change, it’s hard to absorb that he’s already turning 1 soon. Every time I pour a new sippy of formula, I can’t help but feel a little sad that this will be some of the last formula in the house. Then I remember that formula costs us about $5 a day right now, and I do a little internal jump for joy that the end of that huge expense is in sight. We’re planning a low-key brunch fiesta with family and a few friends in town, plus my best friend and her family are flying in for the weekend of the 4th. I’m thrilled that they’re coming to visit and celebrate with us, so we have lots to look forward to in the next few weeks. I’ve recently started repping a brand new gift and accessories company called Lattice & Ivy. All of the items they sell are completely customized, so you can mix and match colors, patterns, monograms, names, and decorative frames to design the cutest things for yourself or for gifts. I’m loving it so far, since I’m getting all the satisfaction I received from making personalized gifts with the kids clothing company I used to run on the side, without having to spend 18 hours a day camped out in front of the embroidery machine. The company hasn’t even officially “launched” yet, so it has been so neat to start at the ground level and work with their Corporate office to fine tune things. An added bonus is that they’re actually based just outside of Phoenix in Glendale (the town where Ryan and I lived when we moved back to Arizona from New York City when he got his MBA at Thunderbird), so I was able to pop by the Corporate office yesterday to meet the team and see the warehouse and production facilities. Such. Cute. Stuff. I’m a HUGE fan of cooking shows. You should have seen the Oscar award winning hard sell performance I put on to try and convince Ryan we needed to go on the MasterChef cruise with Graham Elliott this fall (verdict: too expensive. BOO.) Since we don’t have cable, it’s hard to get my fill of Top Chef and the like right now. It dawned on me last night that there had to be a few good tutorials on YouTube to stream on my laptop and get my fix while I washed the dishes. A few quick searches, and I hit the jackpot- Gordon Ramsay’s YouTube channel. 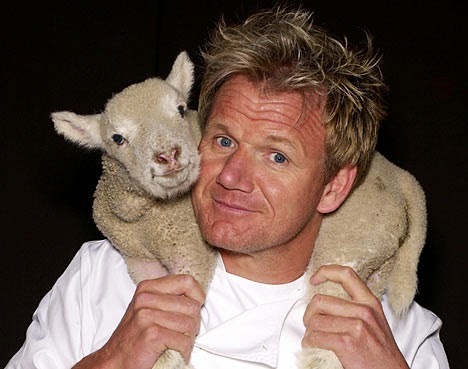 I’m a big fan of Mr. Ramsay’s cooking and overall vibe (even if I’m not big on some of his more dramatic TV shows like hell’s Kitchen). I’ve only watched 2 videos, but have already learned a half dozen new tricks for the kitchen. Pressing play on one of these little videos makes late night sippy cup washing so much easier! I think this garlic and saffron mayonnaise will be my first recipe attempt. It’s hot here in Phoenix. Hotty, hot hot. I’m having a hard time figuring out just how cool to keep our new house without breaking the bank (last month’s power bill was in a very uncomfortable 3 figure range, and in’s not even “summer” here yet!). I came across these pyjamas, and think they’d be a darling way to class up my PJ collection and keep cool(er) at night! They also came in a really pretty blush color, which appears to be sold out… Sad I didn’t scoop them up before they were gone! I watched the documentary Fat, Sick, and Nearly Dead on Netflix over the holidays, and it really made an impression on me. Last month, Ryan and I started eating more “clean” recipes and juicing in the morning using the same ingredients as Kimberly Snyder’s Glowing Green Smoothie recipe. We loved how much more energy we had in the morning (and how much less coffee we needed to survive the morning). Ryan even lost 10 lbs, which was a great side effect. We fell off of the clean eating wagon when everyone came down with Hand, Foot, and Mouth last month, and we’re back to feeling sort of sluggish and blah again. My parents are in town visiting right now, and so we’ve all decided to try juicing for breakfast over the next week to see if my parents get the same benefit we were already seeing. I’ll keep you posted on the results! Cute jams! I had been on the hunt for new PJ short set (thank you post-partum sweats!) and Kate @ EA suggested a pair from Target. They are actually a really nice weight and don't feel cheap for only $20.